You don't have to be married to get The New World. That said, if you are married (as I am) there are certain moments in the book that might resonate in a discomforting way. Out this month on Farrar, Straus and Giroux, The New World is written by Eli Horowitz and Chris Adrian. This combo is the literary equivalent of a two-punch knockout. Horowitz, who lives in San Francisco, was a managing editor and publisher at McSweeney's. He edited Miranda July's brilliant novel The First Bad Man. He co-authored the breakthrough digital novel The Silent History. And if you haven't heard of Chris Adrian, I demand you run out and pick up a copy of The Children's Hospital. It's a sprawling, messy, monster of a novel. For me, it will go down in history as a book ended with me in the fetal position, bawling like a baby as my confused husband tried to soothe me. With this kind of pedigree, I couldn't wait to see what these two minds would devise together. 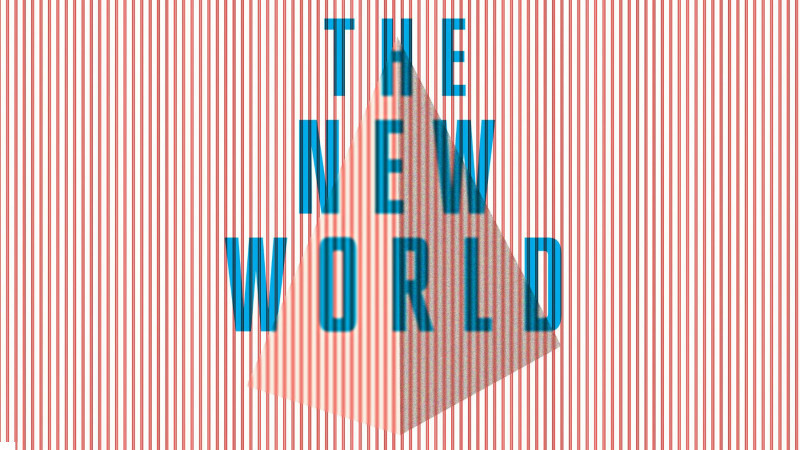 The New World, like The Silent History, was conceived as a digital novella for The Atavist. I haven't read the digital edition. In fact, I didn't hear a peep about this book until last month when I saw that Farrar, Straus and Giroux was publishing it as a traditional paper-bound novel. This review does a good job of breaking down the experience of reading The New World in its original iteration. It's a format that allows for a break in linear narrative structure, and one that probably served the plot of the novel well. The story travels back and forth in time, without much worry about whether the reader knows what's going on. At first, the willing disregard of straightforward narrative made me want to throw the book across the room. As the mother of a toddler who does most of my reading late into the night, I don't have much patience (these days) for willful perversity. I'm glad to have stuck with it, because by page 43, when the mother of main character Jane tells her daughter, "Only Ahab would ever sue in anger," I was riveted. The story is fairly simple. It's a tale of marriage. Cycle One opens with Jane, a pediatric surgeon on her way home from a business trip in Paris. Her husband Jim, a humanistic chaplain who doesn't believe in god, and works at the same hospital as Jane, has collapsed suddenly and died. Jane doesn't know it yet. Once her plane lands, she heads to the hospital. She discovers not only that her husband is dead, but that a shadowy cryogenics company called Polaris has absconded with his head. Despite Jane and Jim's vow to be "always together, never apart," Jim has secretly signed on for a new life in an undetermined future. A life that may or may not include Jane. What follows is a book which unpeels a marriage layer by layer, tragedy by tragedy, vow by broken vow. Each cycle uncovers bits and pieces of Jane and Jim's story. Jane stews in anger, regret, and grief at the loss of her husband (and his head) – a toxic combination which sends her into a tailspin of vengeful thoughts. Jim struggles to navigate a strange new world, where social workers named Alice help the newly reanimated make their way through three cycles towards a beaming Polaris permanent afterlife: Incarnation, Examination, and Debut. Each cycle of the novel represents one of these stages. The only catch? For Jim to wake into his new post-death life, to make his "debut," he must forget everything and everyone that he loved before. "Love and memory are powerfully elastic," Alice tells him. "If you do not cut the connecting strands, then they will draw you back into oblivion." But it's not that easy. Despite betrayals, disappointments, emotional distance, and brazen infidelity, Jim loves Jane with all of his heart. Jane, on the other hand? "Sometimes I love him so much I can hardly stand it. Sometimes it felt like the only purpose in her life was to hurry toward him, and sometimes it felt like the only purpose was to hurry away. And isn't it like that for everyone? she asked." Is it? Like the best novels do, The New World leaves you wondering.